SEGA’s renewed focus on PC means that from now on there will likely be more and more games developed and published by them gracing Steam’s already packed storefront. Given that the Steam Controller has been in the wild for a little while now, I thought it was high time that we at Nerds took some SEGA PC games through their paces with it. 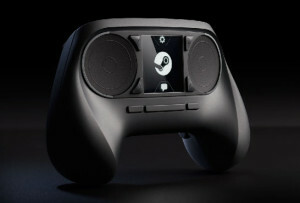 When Valve first announced its three-pronged assault on the living room – that is, SteamOS, Steam Machines and the Steam Controller – the latter was arguably far and away most intriguing part of the proposition. After all, the impracticality of using a keyboard and mouse sans some kind of table has always been far more of a barrier to couch-based PC gaming than the supremacy of Windows or availability of suitable hardware. Valve are generally held in very high regard by PC gamers, to the point where criticising them or anything they do is like a red rag to a bull in terms of setting yourself up for flak from the Internet gestapo. That said, there’s no getting away from the fact that, on first inspection, the Steam Controller feels a little flimsy. This is mainly because, as you’ll see when you first insert batteries, much of it is hollow. Moreover, the apparent weakness of the triggers and paddles on the underside doesn’t exactly leave you with the impression that you’re holding a quality piece of kit. Thank God that the rest of the buttons are serviceable. It’s also worth noting that it’s much more bulky than most other controllers out there, becoming quite uncomfortable to hold after extended play. 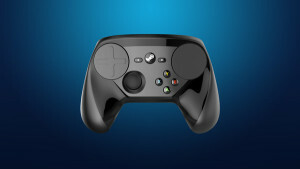 As you probably know already, the Steam Controller’s large dual touchpads were intended to be its pièce de résistance, bridging the gap between mouse and keyboard and joypad. They are probably best described as circular versions of the mousepads you’d find on most laptops. The leftmost of these also features indented directions and will pivot up, down, left and right accordingly. Thankfully, the retail version is much changed from the original concept. But there’s a key difference between touch interfaces and joysticks: resistance. Sticks will pull in the opposite direction and return to their zero point when no pressure is applied, but neither of these things are the case with touch interfaces. Valve’s proposed solution to this problem is to have the Steam Controller use ‘haptic feed’ to give the touchpads at least some of the push and pull we’re all so used to. After just a short time with the Controller, it becomes clear that the beneficial effect of haptic feedback has been overstated somewhat. All it amounts to in practice is varying degrees of localised vibration, the likes which has been present on controllers for 15 years or more. In short, it adds no meaningful physicality whatsoever to movement. In fact, I found the haptic feedback rather annoying and ended up disabling it entirely very early on. And yes, the good news is that if you’re not happy with how a given title controls there are a smorgasbord of options to play with. So many, in fact, that when you boot a game without native controller support for the first time, you’re far better using a community binding as a starting point and tweaking from there as required than starting from scratch. And now, to the games. Despite my initial hopes, the Steam Controller is too fiddly for use with RTS’ such as the Relic’s Dawn of War games or Creative Assembly’s upcoming Total War: Warhammer. Sure, these games aren’t fast paced as such, but still require more precision than its touchpads can muster during large scale engagements. By the time you’ve overshot with the cursor, corrected, corrected some more, and finally managed to click on whatever it was you were aiming for onscreen, you’ve already wasted too much time, or lost too many units or resources. I’m skeptical that any amount of practice would ever bring this control method up to par with the trusty, unerring precision of a properly set-up mouse. Sonic Adventure 2 doesn’t exactly tax the Steam Controller. Next I took a look at Sonic Adventures 1 and 2. Both of these Dreamcast ports feature native controller support. No setup at all was required to get the Steam Controller working with first Sonic Adventure, as it defaults to the standard ‘Gamepad with Camera Controls’ preset, which sets all the buttons to their Xbox controller equivalents, with the right touchpad replacing the right stick. Sonic Adventure 2 didn’t follow suit, for some reason, meaning I had to find a user-created identical binding myself. The end result was the same, however. 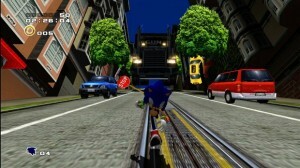 In their original guises, both Sonic Adventures used only one joystick because that’s all the Dreamcast controller had, with panning left and right with the L and R triggers the only means of correcting their notoriously dodgy cameras. All of these buttons are present and behave identically to their Dreamcast counterparts on the Steam Controller, so there’s not a lot to say here. Everything works as it should. Just the ticket for other Dreamcast ports, then. I found the same to be true of Sonic and Sega All-Stars Racing Transformed. Because it only utilises one stick, there’s simply no need to use the touchpads at all. Ho hum. An elephant never forgets… how poor the Steam Controller’s d-pad is. Next I tried Tembo the Badass Elephant, and this is where things started to get a bit more interesting. Tembo is a 2D side scroller, which by default, uses the Steam Controller’s joystick to move the eponymous Elephant around. Being the puritan that I am, I often prefer to play 2D games using directional buttons, so I changed the in-game defaults in such a way that the left touchpad, with the aforementioned indented directions, would be tasked with moving duties. The results weren’t good. When used as a d-pad, the left touchpad feels brittle and unsatisfying to use, requiring too much pressure to register input and protesting with an annoying click as the whole touchpad dips in the direction you pressed. You can change the controller’s setting so that no real pressure is required, effectively using it as touch interface, but that feels equally unsatisfying. Unfortunately, it would seem that the Steam Controller’s poor d-pad solution is one of its greatest weaknesses. I opted to round off my testing with Alien Isolation. 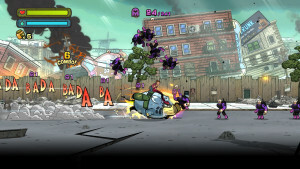 The game features native pad support, so again, default bindings are line with those of an Xbox controller, the right stick bound to the Steam Controller’s right touchpad. But tweak as I might, I just couldn’t get the first person camera controls to feel right, so I instead decided to browse the community bindings, as I had for Sonic Adventure 2, which are helpfully ranked in order of popularity. The most used at the time was one by a gamer called xXGAMERMOMZXx. This person had chosen to have the Steam Controller ape Alien Isolation’s keyboard and mouse controls in lieu of utilising the aforementioned native pad support. Once I’d further increased the right touchpad’s sensitivity, it finally felt like I’d arrived at a binding I’d be able to play with. Thanks, mom. A little too much tongue. But here come the caveats. Because the game thinks I’m using a mouse and keyboard in this mode, all of the onscreen prompts refer to keyboard keys. This is a bit of an irritation when playing a new game, as you’re constantly having to check which keys are mapped to which controller buttons. Not likely to be a problem 20 hours in, of course, but certainly an annoyance initially. There’s worse to come. Despite some initial optimism, it became apparent after a little while chopping and changing settings, that as I’d found with Dawn of War, no amount of touchpad tweaking was going to yield the kind the accuracy I was used to. 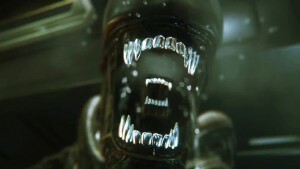 Although nowhere near as much of a problem with an FPS as an RTS, and certainly manageable during Alien Isolation’s slow-paced opening gambit, when you’re wandering around the Sevastopol wondering where the hell everybody is, frequently having to compensate and correct your input can be real handicap later on, when the pace picks up. Also, swiping the touchpad a couple of times to do a 180 degree turn takes a bit of getting used to. A mixed bag, then. If I had to summerise the current Steam Controller end-user experience in one word, it would be ‘compromise’. It’s not as good as a standard controller for console-syle games, but far from seamless as a keyboard and mouse substitute. With good, well-tested community bindings, most games except RTS are at least playable, but in many cases, only in a somewhat suboptimal fashion. As a SEGA gamer, you’re probably better with an Xbox controller or the like for old and new school console ports and a traditional mouse and keyboard for the company’s RTS publishing ventures. More widely travelled PC gamers might find other uses for it, and committed tweakers will love messing around with bindings, sensitivities and the like, but at the time of writing, the cold hard truth of the matter is that the Steam Controller represents a whole lot of effort for mixed and negligible return.